Good food is more than just what goes into a dish; it’s also the spirit and passion of the restaurant’s team. Mount Pleasant’s own Steel City Pizza Co., a local and delicious spot for hot sandwiches, creative slices and more, puts emphasis on working with people as much as offering fresh, tasty ingredients. 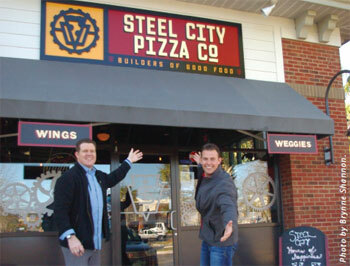 Owners Mark Gray and Adam Carb are enthusiastic about Steel City Pizza Co. in Mount Pleasant. What some patrons of Steel City Pizza Co. might not know is that the restaurant is the same establishment it was nine months ago, when it was known as Giuseppi’s Pizza. In fact, only the name has changed, not the owners, quality or service. With the restaurant’s new name, Gray and Carb have given a nod to their native Pittsburgh, also known as the Iron City or the Steel City. If you look at Steel City Pizza Co.’s menu, the favorites are still there – from hot, cheesy “weggie” sandwiches to hearth-cooked pizzas. If you want to grab a tasty lunch, ordering one of Steel City’s daily specials, from half subs to personal slices, ought to do the trick. Or stop in for dinner and enjoy draft beers and spirits in a friendly atmosphere. Of course, the Lowcountry’s local flavor is also within the walls of Steel City Pizza Co.; according to Gray and Carb, the restaurant donates a lot of food, labor and profit to local charities and works with about 20 local businesses to support the community whenever possible. And although Steel City’s second location in North Charleston is thriving, Gray and Carb are adamant about the Mount Pleasant location being the flagship for as long as the town will have them. For more information about Steel City Pizza Co., visit steelcitypizza.com or call (843) 856-2525.